Please call +1 (877)-275-8238 to learn more about this or other tours. Want to Make It Private? 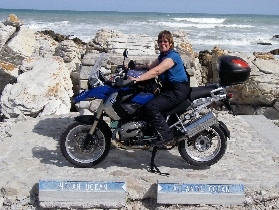 This trip through South Africa and Swaziland offers an unforgettable Adventure for riders who wish to enjoy the unique experience of traveling in Africa by motorcycle. This 14-day Adventure could be named “Best of South Africa”, as it includes more of South Africa’s highlights than you’ll find in any other South African tour. Why fly all the way to Africa and miss any of the following highlights? The “Grand Finale” – two nights in a luxury game lodge located within Kruger National Park which allows for evening game drives. 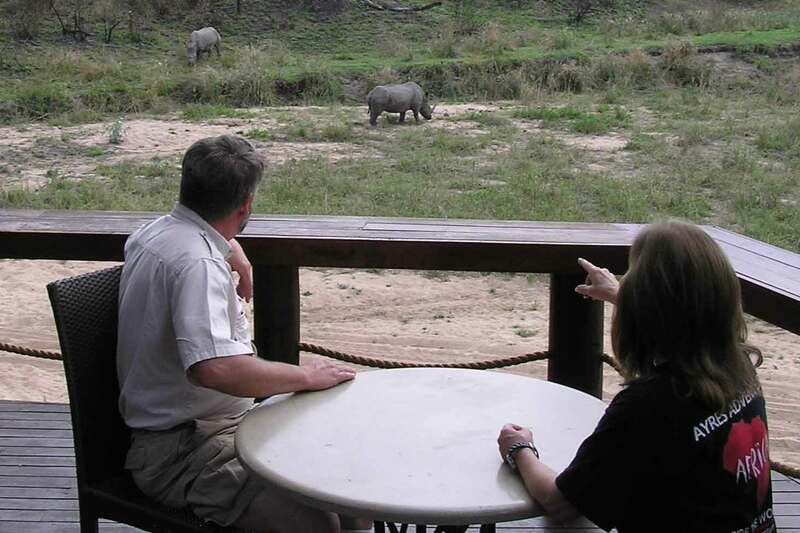 Some competitors offer a game drive through the park but only Ayres Adventures offers two nights inside the park allowing for this exceptional wildlife-viewing experience. Although our route is totally paved and ideal for two-up riding, this tour offers exciting off-pavement alternate routes as well. Off-pavement opportunities include South Africa’s Swartberg Pass, Prince Alfred Pass, Montague Pass, Swaziland’s Saddleback Pass, and others. Multiple game drives, including evening game drives, are an important part of this exceptional Kruger experience. Kruger National Park is one of the largest game reserves in Africa and covers more than 7,000 square miles – larger than the state of Connecticut. The Southern Cross is the only motorcycle tour that features overnight stays within the park, allowing for evening game drives. 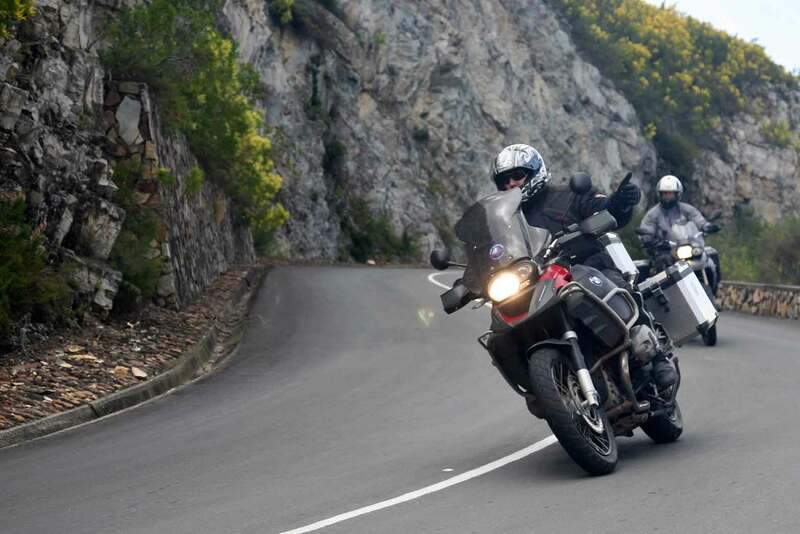 Our Southern Cross Adventure combines many of the country’s most popular motorcycling roads with an opportunity to truly enjoy the wildlife and cultural aspects of this fascinating part of the world. Airport transfer, motorcycle handover, kickoff meeting and our first dinner together! Accommodations at the luxury V&A Hotel and dinner at a first class restaurant on the Waterfront. 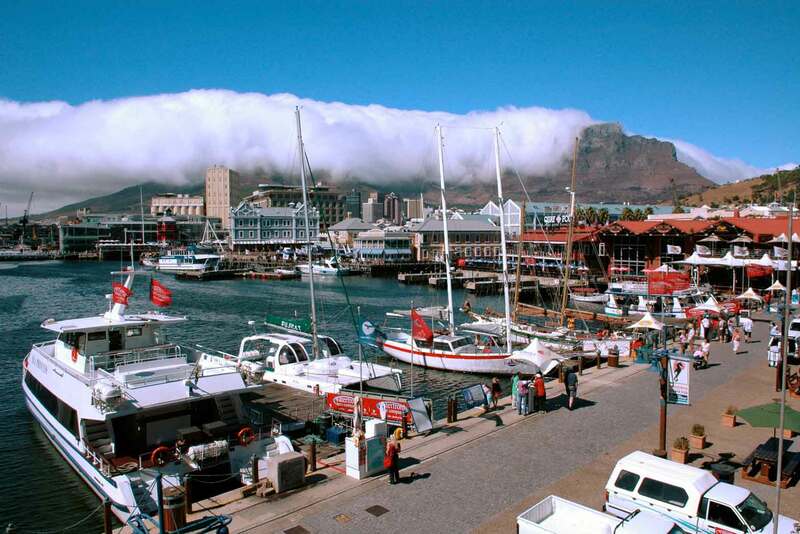 Riders arriving early can visit Table Mountain, take a city tour, or enjoy the cafes, restaurants and shopping that the Waterfront has to offer. 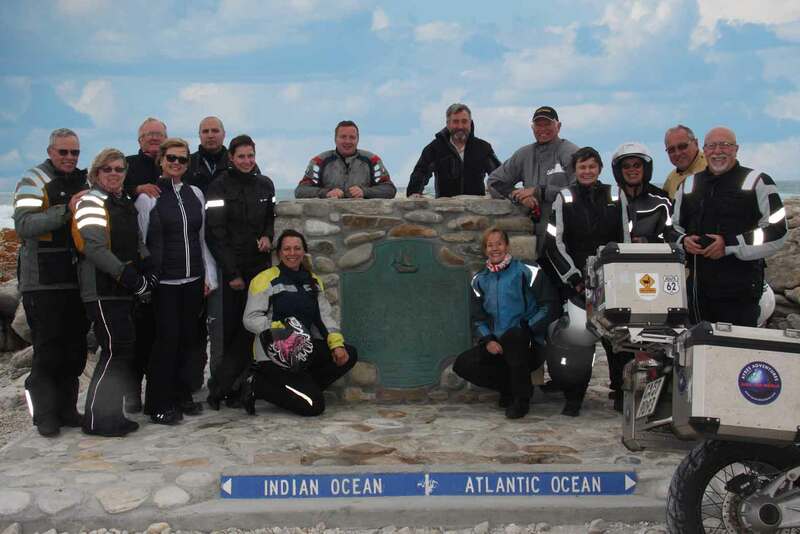 Ride the beautiful coastal route through Gordon’s Bay, Betty’s Bay and Hermanus to Cape L’Agulhas. After a gourmet dinner, enjoy the ocean view from your private balcony. 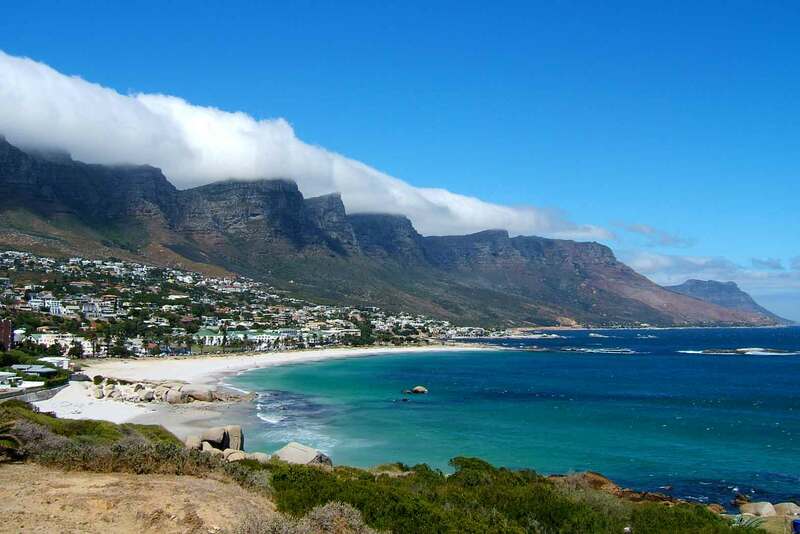 Highlights: Visit the southernmost point on the African Continent, where the Atlantic Ocean and the Indian Ocean meet. 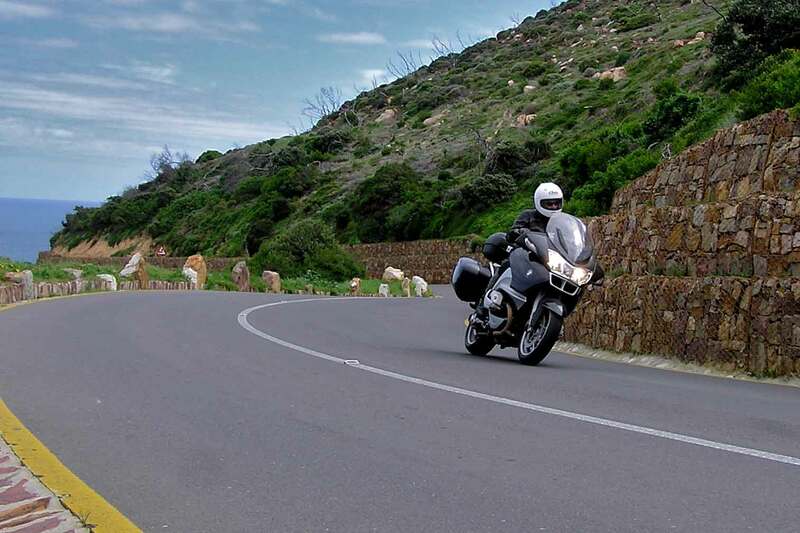 Ride South Africa’s famous wine route, enjoy beautiful mountain sweepers, and enter the Swartberg Mountains. Highlights: Tradouws Pass, South Africa’s wine route, The Klein Karoo (semi-arid desert), Oudtshoorn (the ostrich capital of he world). Enjoy an overnight stay at a working wine and ostrich farm in the setting of a 4 star Cape Dutch Country House. 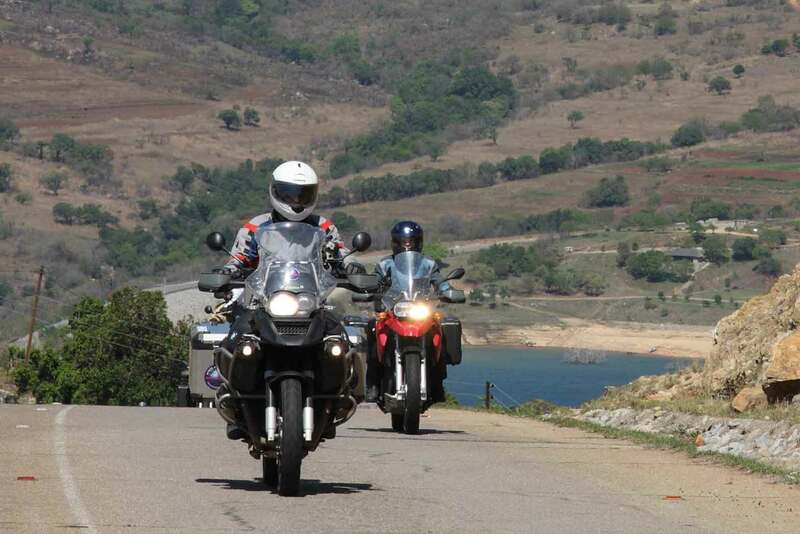 Spectacular riding through various mountain passes and valleys. 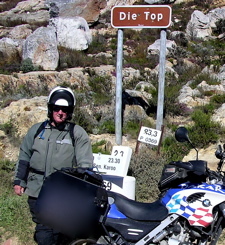 Highlights: Swartberg Pass, Meeringspoort Pass, Outeniqua Pass, Four Passes, and numerous smaller mountain passes. Knysna is a small South African town that has consistently been voted “the most popular vacation destination in South Africa”. Highlights: Visit the “Knysna Heads” – the most striking geological feature along the entire southern African coastline. 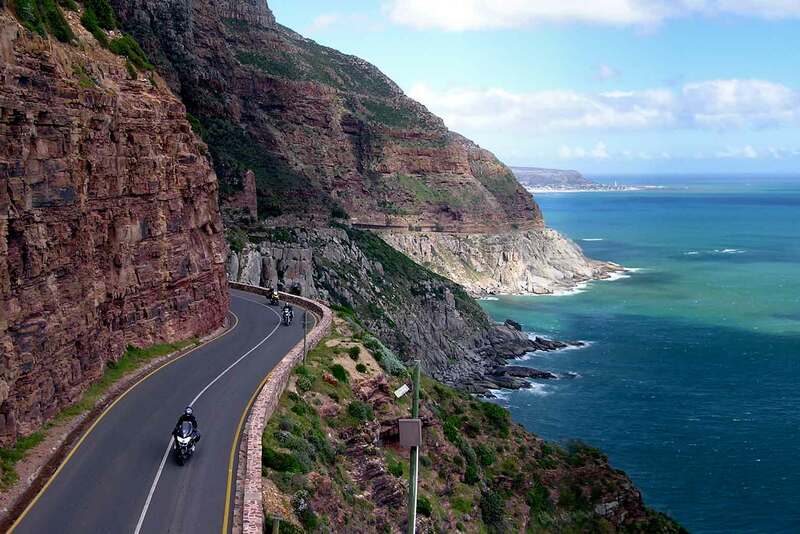 Other options include riding the gravel Prince Alfred Pass, a leisurely train ride along the Indian Ocean to the railroad museum in George, the Knysna elephant sanctuary, or the world’s highest bungee jump at the nearby Bloukrans River Bridge. Or stay in town and enjoy the interesting shops and cafes in Knysna. 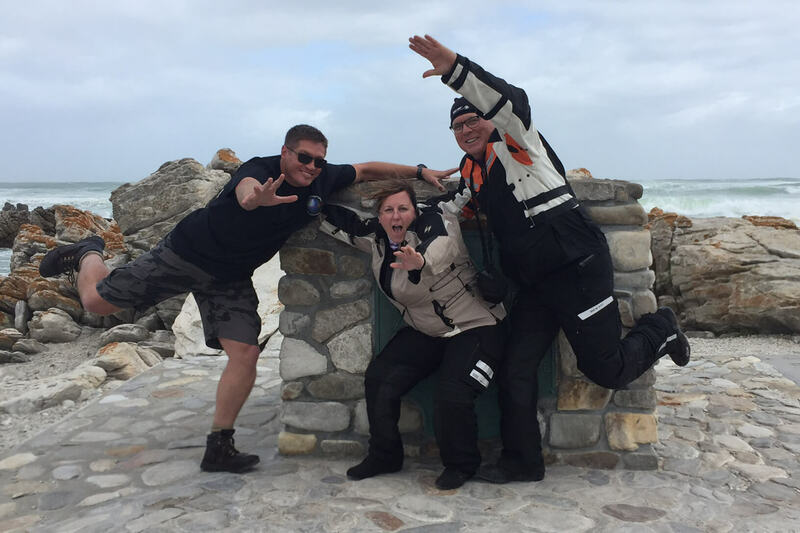 An easy, picturesque ride as we ride along the East Coast past the city of Port Elizabeth to the beautiful little town which is home to Rhodes University. Highlights: Beautiful roads as we leave South Africa’s Garden Route and head for the Wild Coast. Tonight we will stay in a Country Club Hotel in the heart of the Eastern Capes popular sunshine coast, a short distance from the Indian Ocean. See traditional South African life as it exists in rural areas of the country. Pass through the former Transkei and Siskei areas, which during the apartheid years comprised the black “Homelands”. Landscapes are very pretty, with deep valleys and many scenic overlooks. Our destination is Port St. Johns where we will be staying at a wonderful resort and spa for the evening. Today we will head inland through Kwazulu Natal Province, home to the Zulu people. We will have several opportunities to see the traditional ways of living as we pass through several small Zulu villages. From Kokstad we will ride through rural farmland as we head towards the foot hills of the spectacular Drakensberg Mountains to the small town of Himeville where we will spend the night at a beautiful Manor. After riding along the outskirts of Pietermaritzburg, the capital city of Kwazulu Natal, we head through the sugar cane growing areas towards Dundee where we will be spending the night. Located near the famous battlefields we will have the chance to learn about history of the battles between the Zulu’s and the Boer’s. 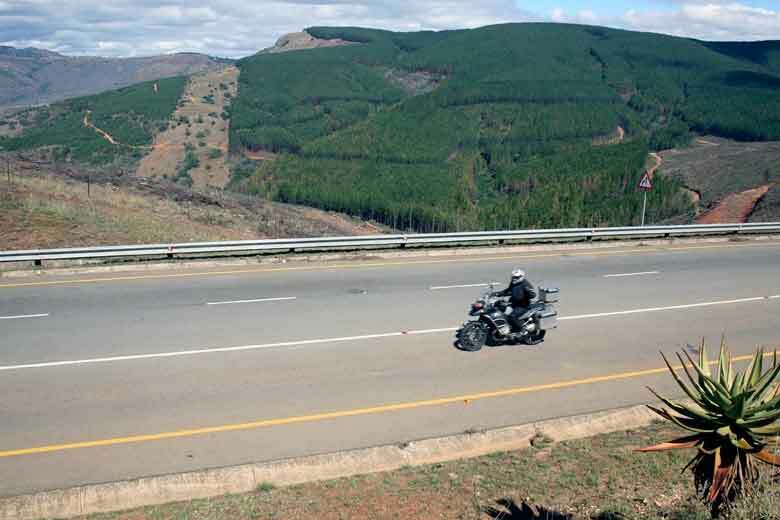 After riding through the farming areas and the town of Piet Retief, we will cross the border into Swaziland where we will enjoy some spectacular riding as we ride through the Swazi Mountains. We will spend two nights in one of the most popular game parks on the African continent. 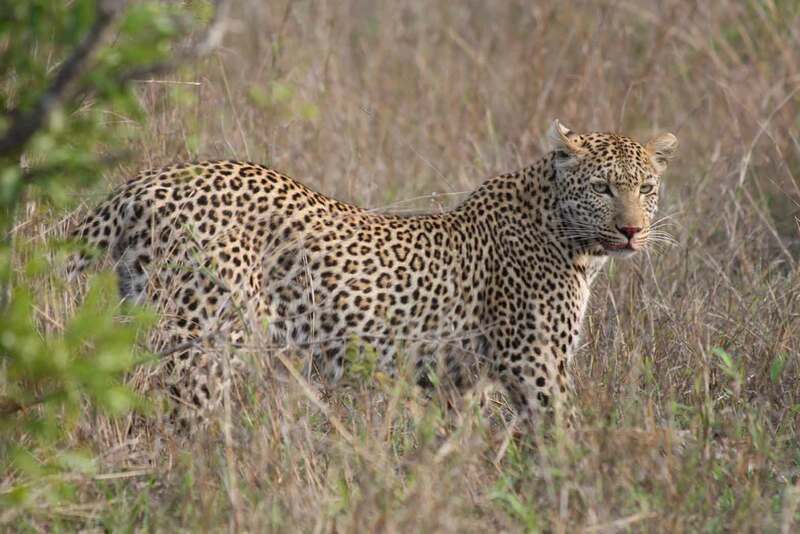 Staying in Kruger (as opposed to visiting it for a few hours during the daylight hours) provides the unique opportunity to do game drives after dark as well as during the day. Most of our guests are able to spot all five of Africa’s “Big Five” during their stay (Elephant, Lion, Leopard, Rhino, and Cape Buffalo). 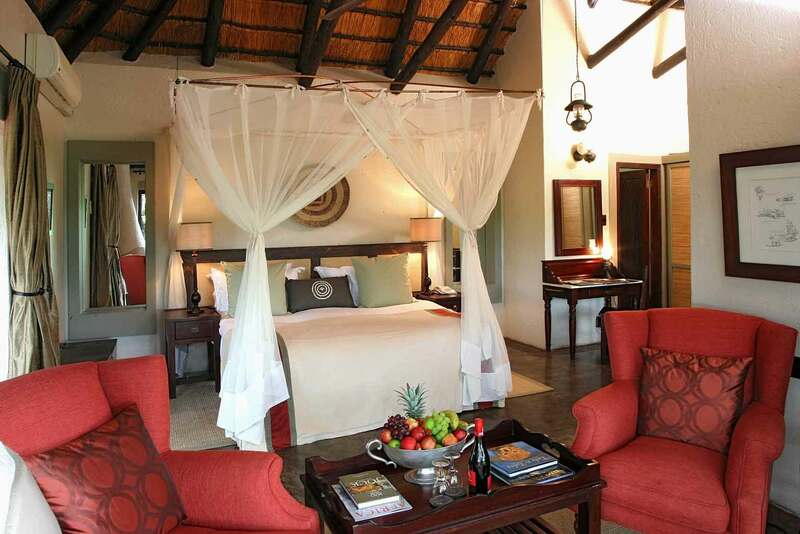 We’ll enjoy luxury game lodge accommodations and dining under the African skies. 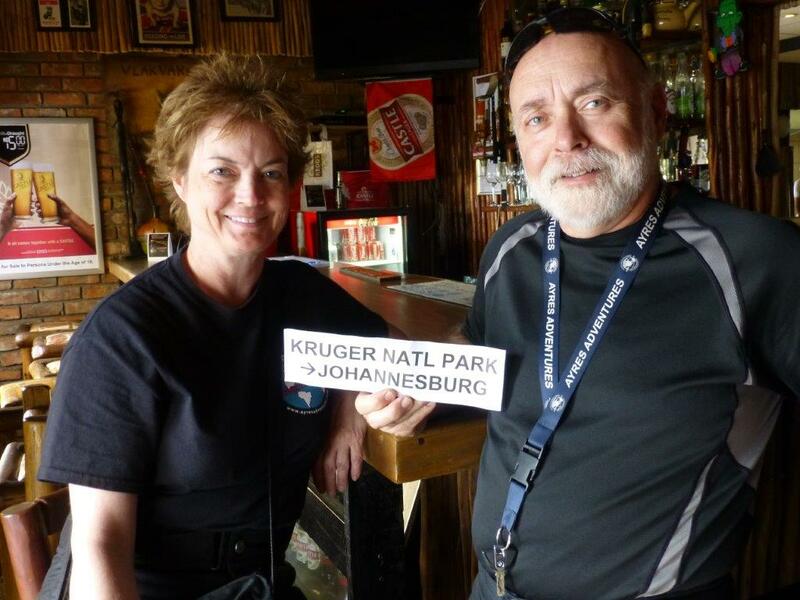 The free day in Kruger National Park is certainly one of the most important highlights of the Southern Cross Adventure. You’ll enjoy both morning and evening game drives, including a “sundowner” game drive. Sip your favorite drink as you watch the sunset over the African bush. We’ll enjoy an easy final ride into the Johannesburg area where we’ll have our final celebration dinner at one of the many fine restaurants in Sandton. After a relaxing breakfast at the hotel, the tour leaders will arrange your transfer to the airport for your flight home. The route is entirely paved, with a variety of road features. 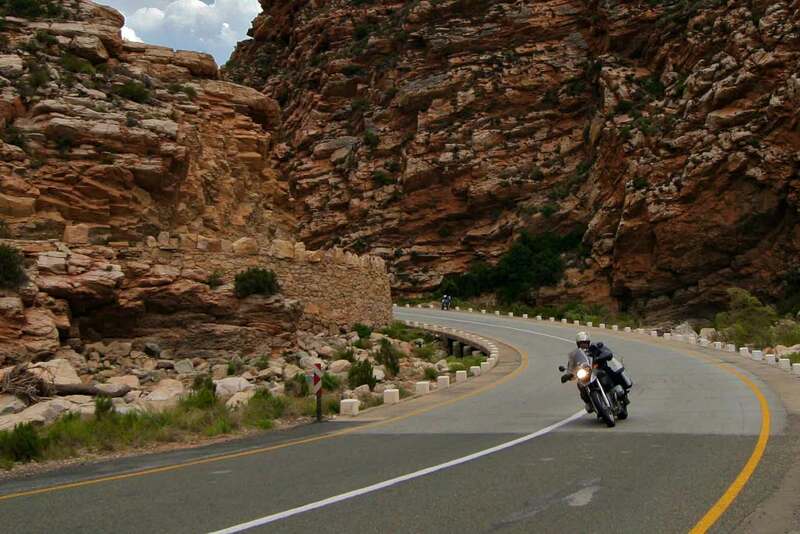 The route over the Swartberg Pass consists of 30 kilometers of gravel and is optional. The pictures may include optional equipment. Personal motorcycle: deduct $1,900 from the rider price. The single supplement applies for riders who request single occupancy. It also applies for cases in which a rider wishes to share a room with another rider, but there are no riders available or willing to share a room. Single room supplement – $1,425. Our high expectations were substantially exceeded from the moment we arrived in Africa. After a few days at home Araceli and I are still digesting the many wonders we had the opportunity to enjoy during our tour throughout your amazing country. Our high expectations were substantially exceeded from the moment we arrived in Africa. Every single detail of the trip was wonderfully organized and the selection of roads, lodges and restaurants was outstanding. Both Jason and Braam did a terrific job making sure we had a great time, explaining many interesting things about multiple aspects of your country, facilitating superb riding opportunities and always willing to go the extra mile. A big thank you for all that. We both have been bitten by the African bug and as you know we are already thinking in doing the Heart of Africa tour next year, so we will definitely be in touch. Ayres Adventures you have done it again! tour participant. Ayres attention to detail sets them apart from other touring companies. Thanks again for another great adventure. Chris and Jann created a video about our Call of the Wild Adventure. Click here to watch the video. I just returned from South Africa and my first Ayres Adventure with a dozen customers. I've nothing but praise for the entire team. The Southern Cross Tour was everything it claimed to be and much more. From the bikes to the lodging to the dining it was all fabulous. Our two guides insured it was an incredible two weeks and represented what I feel is a fantastic value for the money. I will be selecting our next tour very soon! We have been bitten by the "Ayres Bug", so we will certainly be on another trip very soon! I have wanted to write and thank you and Barbara for a truly wonderful vacation. What makes a great vacation? Superb food, outstanding accommodations, well planned itineraries, new friends who share the same values, new challenges every day all with a sense of security knowing that there is great team (Ayres) behind you. The net result is a truly fun time and a remarkable memory and to Lori and I who went on the Southern Cross trip all this came to pass and more. We have been bitten by the "Ayres Bug "so we will certainly be on another trip very soon. Thanks to all your wonderful team: John constantly keeping the group's fun in mind and taking care of every little detail and with a great sense of humour, ED who was such a gentleman and pleasure to travel with. Lori especially spent a lot of time with him and talks highly about his thoughtfulness and kind spirit. 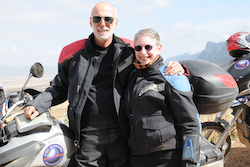 I can also say that to anyone who is thinking of taking an Ayres trip but whose companion is not a lover of the "Two Wheels" mode of transport, the companion vehicle is a great way for couples to share some truly memorable trips to some very unique and interesting places. These trips allow a multitude of dinner stories recounting the fun. Still full of great food and fantastic memories, we are home from Brazil. I will be wearing my new Ayres' Adventures Best of Brazil shirt on the Thursday night ride with the locals tonight. Brazil was beyond our wildest expectations. Congratulations on putting together such a memorable event. The planning and organization that went into the African Southern Cross made this trip very special for me. I recommend this excursion to anyone who would like a very special holiday on a motorcycle. Now I'm dreaming of an Ayres Adventure in South America!. All of the tours that I have taken with Ayres Adventures have been excellent from start to finish. The itineraries, accommodations, and activities during the tours have provided many incredible experiences. 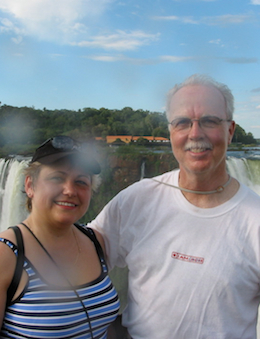 Ron and his tour leaders have a way of finding the very best in each geographic area in which they travel. You win the Oscar for the category of "The Company that Works the Hardest to Please a Client!" The sixteen tours we were on with Ayres Adventures are the best we have ever been on! 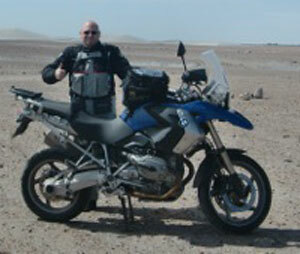 “We have taken more than 20 motorcycle tours; sixteen of the last seventeen were with Ayres Adventures. Biker's delight. These are the words that come to my mind when I think of my Ayres Adventures tours. Great rides, sensational places, good food and great fun. A big "Thank you!" to the whole Ayres team for creating such an experience, you're doing an awesome job. I am looking forward to riding with you again. 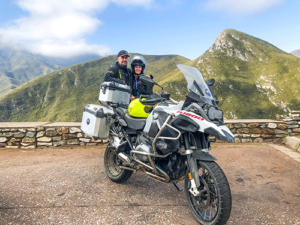 My son and I rode the Ayres Adventures Machu Picchu trip over a year ago and we had so much fun I decided to go on my own trip to South Africa, at Ron Ayres suggestion. I'm a fair weather, slower rider, the type that likes to look at scenery, stop often, and avoid highways, so after Machu Picchu which really challenged me, I asked Ron for something more suitable to my style, and the Southern Cross trip fit my needs perfectly. It had everything: beautiful scenery that included seascapes and inland hills and valleys, cultural offerings by the Zulus in S. Africa and the Bsuto in Swaziland, game reserves and Kruger National Park where the big animals walked in their natural habitat, and most touching to me, visiting an orphanage and school where we met some children and which offered us the opportunity to give back a little by connecting them with possible resources in the USA. The accommodations and the food were always the best, especially Otter's Den, where we were treated like family by the hosts and where I felt like I might hear Tarzan yelling as he swung from branch to branch. John Jesson and Chris Carey offered wonderful support as group leaders, and they made my experience work, especially since I ride slower than most and I was traveling alone. It's not easy to satisfy everyone with different needs, but they did. The planned visits included a snake reserve, elephant farm, balloon ride, and could have included the highest bungee jump in the world. This trip had a little of everything and it makes me want to go back to Africa. We can't wait for the next one! It’s been less than two weeks since we completed the African trilogy and I’ve wondered how I’d ever find the words to describe our feelings about this extraordinary adventure. When the October 2008 Waypoints Bulletin arrived, it gave me the perfect start. As one who had to “overcome initial apprehension about travel to the ‘Dark Continent’,” I can honestly say that none of my fears materialized. Nick and I fell in love with Africa. From day one and throughout nearly seven weeks of travel, Africa grabbed us with the warmth of the people, the cultural diversity, the mind-blowing wildlife, and the spectacular scenery. Ayres Adventures delivered in its usual superb fashion on each and every day of the three distinctly unique tours. The “Southern Cross” could be described as “Africa 101”, offering a taste of everything—from the busy, upscale Capetown waterfront to the luxury of L’Agulhas Country Lodge, from the cultural experiences in Eshowe and Shakaland to the overall African immersion at Otter’s Den. Leaving Johannesburg at the start of the second tour, we mistakenly thought ourselves steeped in a sense of place. Then came Shibula Lodge and we realized that a very different African adventure was just beginning. The “Call of the Wild” is truly all about the wildlife—watching the elephants crossing the river in Chobe can only be termed a life-altering event. As for Namibia, we’ll never forget the sands—towering over us on the dunes and shifting under our tires as we crossed the Kalahari! But the challenge was thrilling and the landscapes incomparable. We’ll always be grateful to the Ayres “family” with whom we shared this amazing experience. So while "doing 'Africa Ayres Adventures Style'" may be addictive, I think it’s more accurate to say that we’ve simply become addicted to Ayres Adventures. We can’t wait for the next one! Call of the Wild - TWICE! 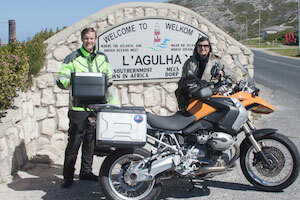 Susan wrote an article about her African trips which was published in BMW Owners News. Click here to read her article. Our trip was beautifully planned. Our first Ayres Adventure was everything we'd hoped and more. John is extraordinary at what he does. We really appreciated his sincere caring, competency and sense of fun. When asked where we were headed that day by a waitress at a coffee stop, a fellow rider said, "I'm not sure. It's like going on vacation with Dad. We just follow him and everything's taken care of, everything's wonderful." Our trip was beautifully planned. 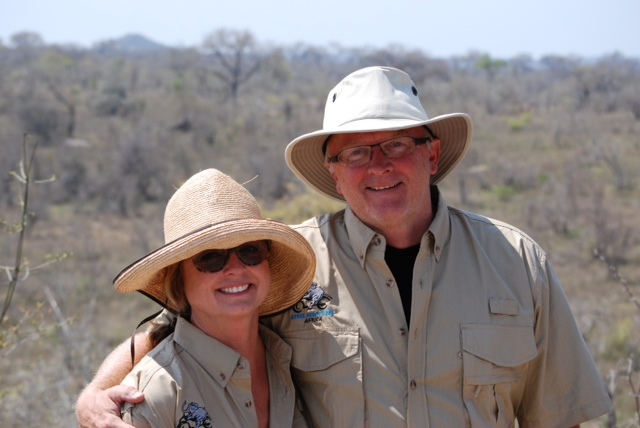 Greg and I enjoyed the variety of accommodations, from a luxury waterfront hotel, to a country lodge, to a 100 yr. old farmstead, to a tented tree house, and especially the opportunity to visit the Zulu school and AIDS orphanage. We felt that we learned a lot about the country, rather than just passing through it. We're looking forward to future Ayres Adventures. South Africa definitely captured our hearts. 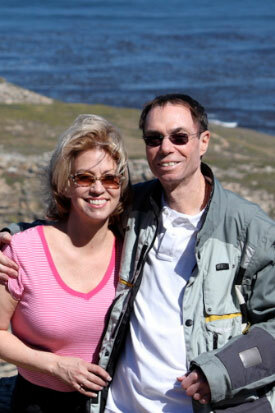 Recently my wife Chris and I took an Ayres Adventure trip through South Africa (from Cape Town to Johannesburg). We have nothing but good things to say about the Ayres people, having done several "adventures" with them, in various parts of the world. They are first class, and go the extra mile to take good care of their customers. 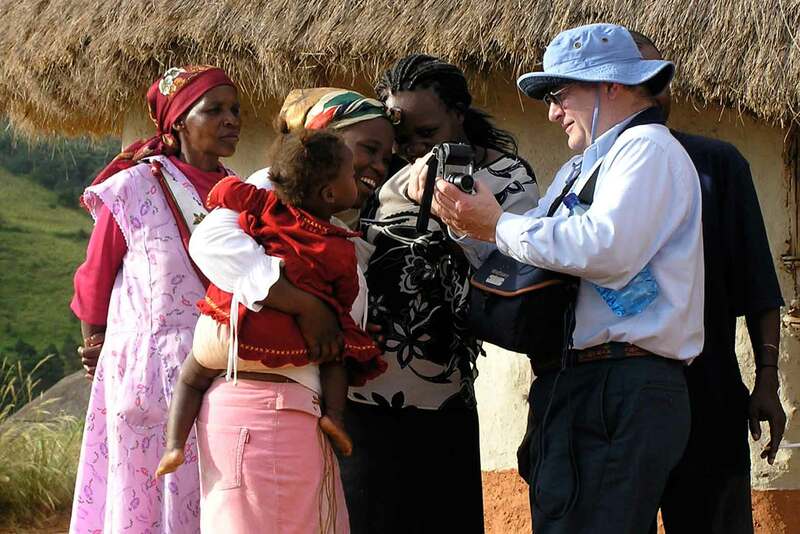 The Africa trip was exceptional in every respect. Ayres has a knack for picking exotic places to visit and stay. Kruger is breathtaking and Swaziland is really cool. We totally recommend anyone that wants to do an overseas adventure to strongly consider this opportunity. 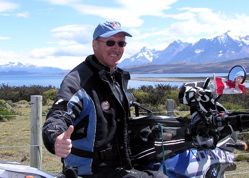 While searching on-line for motorcycle travel I came across the Ayres Adventures website. The site was far and away better than any other so I called Ron, took a chance, signed up for the South America 5 Flags Tour and never looked back. The trip was well run and well planned, offered reliable road support, experienced tour leaders and attracted fun, adventurous people. The next trip I took was an Ayres Adventure to Africa and this past summer I rode with Ayres in Alaska and Yukon Territory. By now I knew I could count on Ayres for exceptional road support and tour leadership and I was not disappointed. 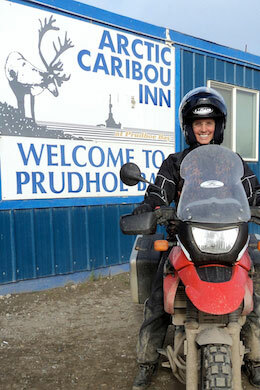 The Alaska challenge for me was riding the Dalton Highway to Prudhoe Bay and our leaders, John and Ed, aside from the expected road support, offered moral support and encouragement. I couldn't have done that ride without them. My challenge now will be deciding which Ayres Adventure to sign up for next. 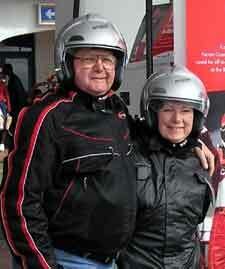 We are happy to book any of our motorcycle tour as a private tour. For most tours, we require a minimum of 8 bikes, or 12 participants (riders plus co-riders). We can provide a private motorcycle tour for smaller groups, but a surcharge may apply. We can also customize any of our regular tours for a private group.